Is The DKN RB-4i Recumbent Exercise Bike As Functional And Comfortable As Hoped? Recumbent exercise bikes are meant to be a more comfortable, relaxing and perhaps more stylish way to exercise, and this is what the makers of the DKN RB-4i Recumbent Exercise Bike hope to provide. This machine aims to present a comfortable approach for users of different size, with this adjustable seat and pedals, and looks pretty good. There are also high expectations on the workout based on the promise of all those programs, features and user-friendly elements to the machine. Is this the ideal option for those that want a strong, fun workout at a more relaxed pace? What benefits have been highlighted in users reviews for this DKN RB-4i Bike? Starting with this idea of comfort for different users, this fitness bike has a padded seat with support on the back and arm rests. 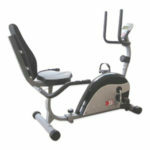 It is designed to help a users with a weight of up to 150 kg, which is higher than some other machines. The distance of the seat from the pedals and recline can also be adjusted, which will help people of different heights. Another adjustable element is the 32 levels of resistance from that 11kg flywheel, which again adds some versatility to the machine. This and the 4 users profile options highlight the accessibility of the machine even further. 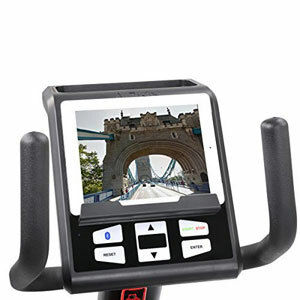 As for the workout, this machine offers 12 programmes, a heart rate function via pulse grip sensors and compatibility to the DKN iWorld and DKN-Motion apps. All of the data is shown and the colour LCD display, which appears to be pretty functional and easy to read. What downsides have buyers pointed out in their reviews for this DKN RB-4i Recumbent Exercise Bike? This is a large, sturdy model for many users to enjoy within a home gym. As a result, there are potential issues with the assembly and the portability of this DKN exercise bike. This indoor recumbent bike isn’t especially difficult to put together, although it can take a couple of hours with all the parts. The hardest element is getting all the heavy elements together. This requires a second pair of hands. The weight also means that when the machine is in place in the gym, living room or wherever else it is going, there is little chance of moving it. Buyers are advised to find a good permanent spot for this model where it will stay put. There are transport wheels on the bottom, but some feel that they are so poorly positioned that they don’t may the task any easier. Summary: does this issue mean that the DKN Recumbent Bike is no longer recommendable for home use? With these issue of assembly and transportation to one side, there are still plenty of positive elements to this product that mean that it should be a great option for many people looking to get back into shape. The seat, adjustments and profile options mean that this DKN exercise bike really is a comfortable accommodating machine and the potential just increases further with those programmes and resistance levels. Buyers really can sit back and get a lot out of this bike. You can check out more customer reviews about the DKN RB-4i Recumbent Exercise Bike on Amazon here.